The Mojave rattlesnake, living in the deserts of the southwestern United States and central Mexico, is characterized by its lethal venom that can either shut down your body or tenderize your insides. Clemson University researchers say which one depends on where you're located. Based on snakebite documentation from Mojave rattlesnakes as far back as the 1920s, it was thought that these feared pit vipers only had neurotoxic venom, a cocktail of enzymes and peptides that disrupts neurons and paralyzes the nervous system. However, a few cases were curiously different, with patients displaying symptoms such as tissue damage, disorientation and difficulty clotting blood. 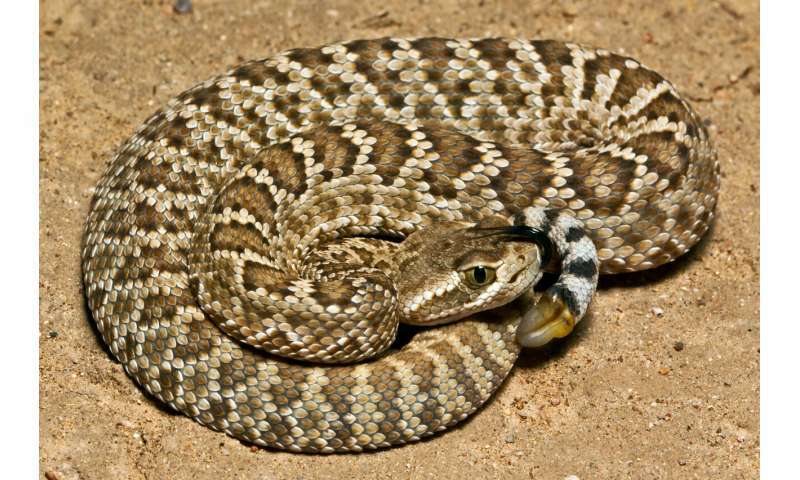 After several decades of inquiry, scientists later credited these symptoms to a second venom type in the Mojave rattlesnake: hemorrhagic, which acts by destroying tissues in the body. To discover which venom type occurs where, herpetologists—the amphibian-and-reptile-loving scientists—have been collecting data on Mojave rattlesnakes in the Southwest. However, it wasn't until a recent publication by Clemson College of Science postdoctoral researcher Jason Strickland and professor of biological sciences Christopher Parkinson that the extent of the distribution was better understood. Their findings show a peculiar variability in the species. 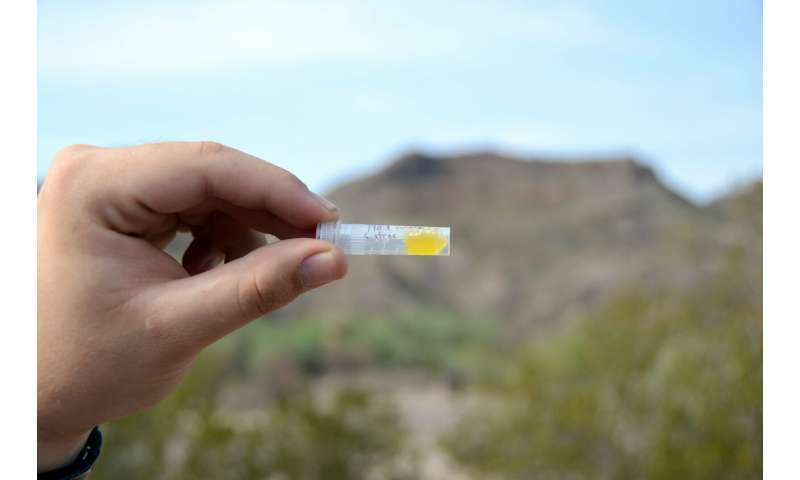 "Prior to this paper, the 'herp' community thought that hemorrhagic venom was really rare and was only in one location in Arizona and one location in Mexico, but we show that it's found in several places throughout the snake's distribution," Strickland said. "There were a few instances when individuals in our sample had both types of venom, which our data suggest are hybrids." This preservation of multiple venom types within one species defies science's expectations. The principles of natural selection—survival of the fittest" as it's colloquially known—would predict that one of the venom types would fix and the other would slowly diminish over the course of several generations. The venom that wins out is dependent on which type—hemorrhagic or neurotoxic—best suits the Mojave rattlesnake as it hunts for prey in the arid desert. Yet this is not what's happening. The finding is made more peculiar by the results of a summer 2018 study that discovered four genetically distinct lineages of the Mojave rattlesnakes throughout the southwestern U.S. and central Mexico along with evidence that the lineages are breeding with one another. Diving deeper into natural selection, this swapping of genes among Mojave rattlesnakes should have reduced the genetic diversity between their lineages, effectively homogenizing venom types until the fittest rules. "From an evolutionary standpoint, this is abnormal. This is not what you'd expect," Strickland said. "Gene flow should prevent this much variation. But even with the amount of gene flow we find in these populations, the selection is strong enough to maintain these specific venom types in a very local environment." "What we've been able to show is that there are local optima. In Texas, the neurotoxic venom type seems to be the optimum for this species. But if we go south into Mexico or over near Phoenix, something in nature is changing, where the local optimum requires a different venom type," said Parkinson, who holds a joint appointment at Clemson University in College of Agriculture, Forestry and Life Science's forestry and environmental conservation department. The discovery required a large research collaboration between the principal investigators and students in five labs across the U.S. and Mexico, in addition to almost 100 citizen-scientists whom Strickland and colleagues assembled through social media and networking. 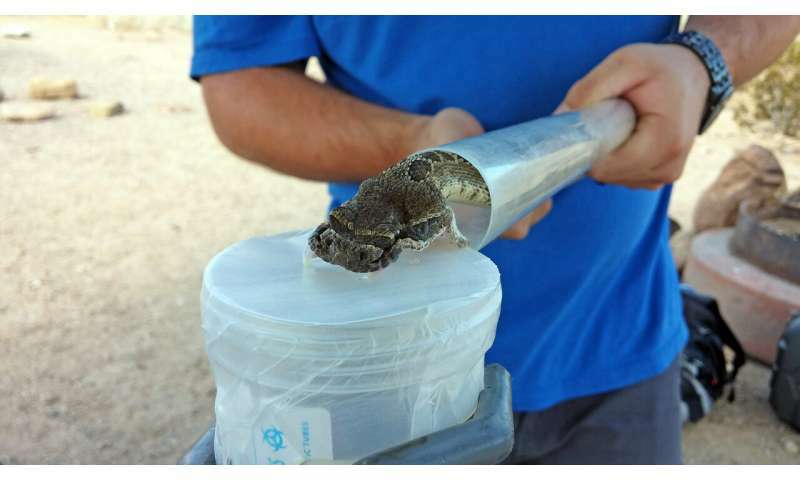 In sum, the researchers collected 216 Mojave rattlesnakes for their study in California, Arizona, New Mexico, Texas and Mexico. The "herp" community, it turns out, is a strong one, with everyday snake enthusiasts eager to help researchers for the betterment of the snake species. The team met some of those "herpers" at an annual west Texas conference called SnakeDays—directed by enthusiast Jeff Adams—that unites citizens who are interested in reptiles, as well as academics, fish and wildlife law enforcement and "herp" photographers to celebrate and raise money for wildlife diversity conservation. "By relying on the people at SnakeDays, what would have taken Jason and Chris 10-20 years' time to study was then completed in just a few years," Adams said. "It's much more efficient for scientific professionals to rely on citizens outside of their research boundaries, because citizens know more about finding the local flora and fauna. It's also cost efficient. Citizen science reduces the cost of research projects so that researchers like Jason and Chris can better utilize their funding." It's the citizen science aspect, as well as "the educational aspect of graduate students and postdocs working across borders," that Parkinson takes away from this study. "The science is really important, no question, but collaborative research and citizen science are so important to move science forward. It's not just about some geeky academic sitting in a room anymore, it's about how the research affects people," Parkinson said. Less than 1 percent of the U.S. population is bitten by a venomous snake each year, and even fewer die from their symptoms. For the few unlucky people who are bitten, knowing the Mojave rattlesnake distribution can lead to better treatment outcomes. If doctors know what venom type persists in their region, they can administer the proper treatment more strategically. "These authors have published the most extensive study of one of the most medically important snakes in North America, delivering provocative novel perspectives and surprising new discoveries," said Sean Bush, a clinical herpetologist at Eastern Carolina University. "This work provides an understanding of how and why venom varies, which translates clinically into a foundation for anti-venom development, drug choice and the tailored medical management of snakebite." For scientists, the team's study points toward the Mojave rattlesnake as being a fascinating model species for population genetics and evolutionary studies. Whether related to prey, the environment or a dietary shift over the course of development, why is the Mojave rattlesnake challenging science's predictions? What is the mechanism? Future research in the Parkinson lab intends to consider these questions through studies of venom evolution in New World snake species. Variable venom—why are some snakes deadlier than others?